We hadn’t had these tacos in forever and I wanted something quick and pretty effortless. 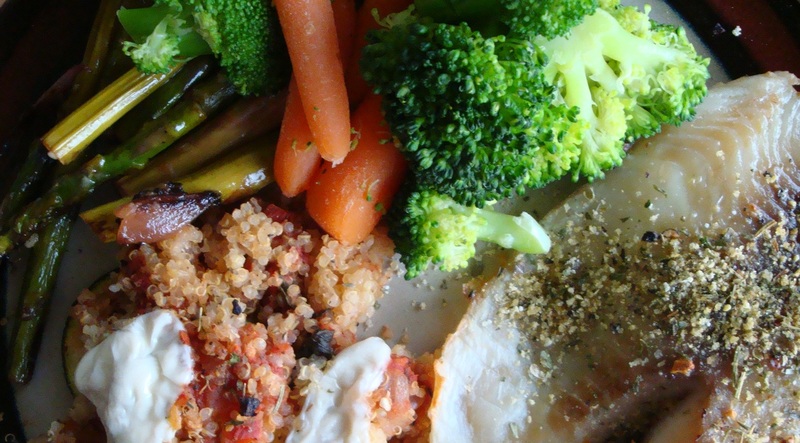 I found this recipe from Eating Well a few years back and we love it. I usually make as the recipe states, but we didn’t have turkey, so I made them with all beef. The recipe is supposed to serve 6 with 2 tacos each. In the past i’ve made it into 4 servings instead of the suggest 6. I only made 6 shells. They are WAY better than any store bought or restaurant. Place beef, turkey and onion in a large nonstick skillet over medium heat. Cook, breaking up the meat with a wooden spoon, until cooked through, about 10 minutes. Transfer to a colander to drain off fat. Wipe out the pan. Return the meat to the pan and add tomatoes, cumin, ground chipotle (or chili powder) and oregano. Cook over medium heat, stirring occasionally, until most of the liquid has evaporated, 3 to 6 minutes. Per serving: 98 calories; 2 g fat ( 1 g sat , 1 g mono ); 35 mg cholesterol; 3 g carbohydrates; 0 g added sugars; 17 g protein; 1 g fiber; 243 mg sodium; 26 mg potassium. Wrap 4 tortillas in a barely damp cloth or paper towel and microwave on High until steamed, about 30 seconds. (Alternatively, wrap in foil and heat in the preheated oven until steaming, 5 to 7 minutes.) 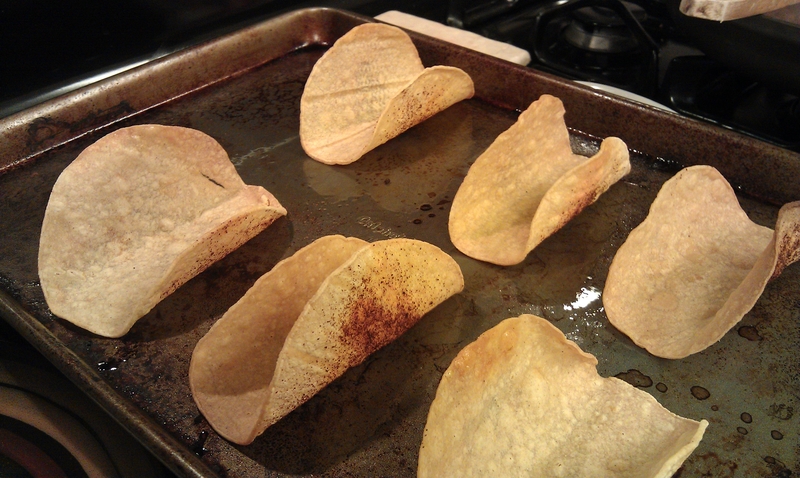 Coat both sides with cooking spray; sprinkle a little chili powder and salt on one side. Remove the shells from the rack and repeat Steps 2 and 3 with the remaining 8 tortillas. Working with 6 tortillas at a time, wrap in a barely damp cloth or paper towel and microwave on High until steamed, about 30 seconds. Lay the tortillas on a clean work surface and coat both sides with cooking spray. 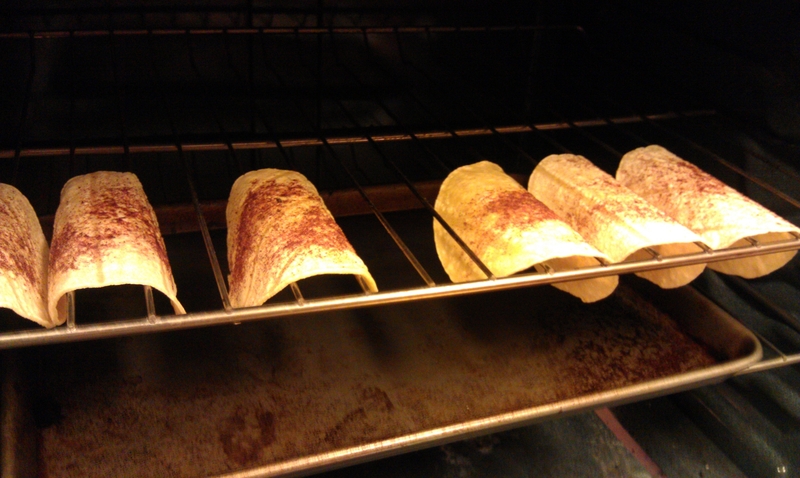 Then carefully drape each tortilla over two bars of the oven rack. Bake at 375°F until crispy, 7 to 10 minutes. Per serving: 114 calories; 2 g fat ( 0 g sat , 0 g mono ); 0 mg cholesterol; 23 g carbohydrates; 0 g added sugars; 3 g protein; 3 g fiber; 124 mg sodium; 103 mg potassium. 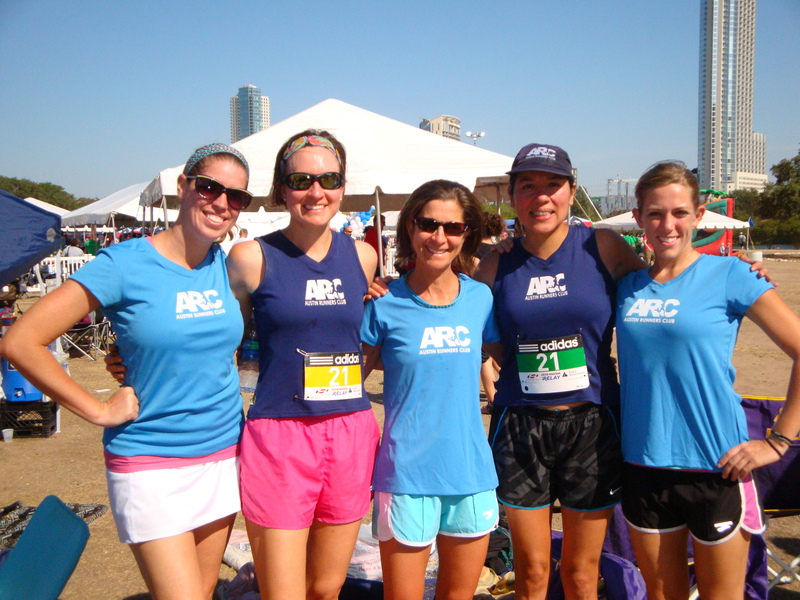 We ran with our core Angels: AK, Megan, and myself and 2 newbies. They were new to our team, but very much not new to running. 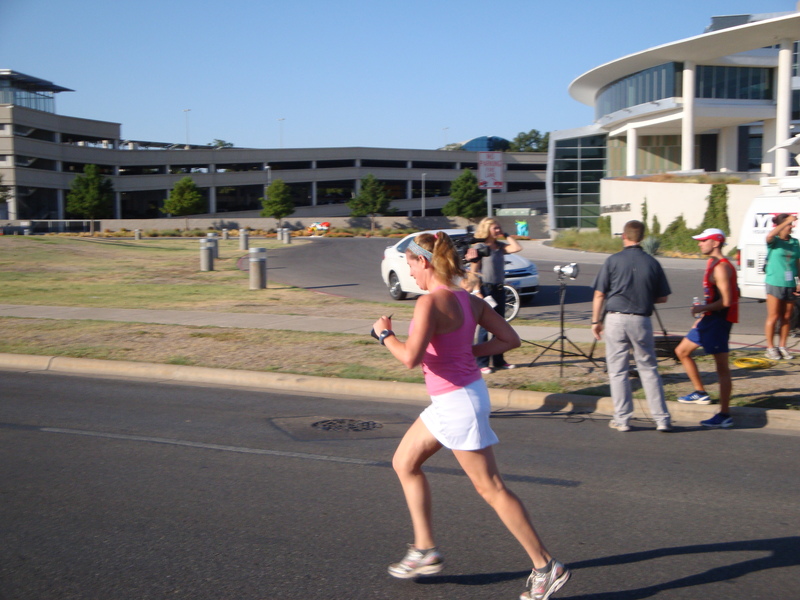 Ruth ran our 1st leg, which was the 12K. She got to start at 7:15 and she said that already the heat and humidity was killer. Crystal ran the 2nd leg, which was the first of the 10Ks. Apparently all of the mile markers were backwards and she didn’t wear a Garmin, so that freaked her out (I would have too). Megan ran the 3rd leg, which is the 2nd of the 10Ks. 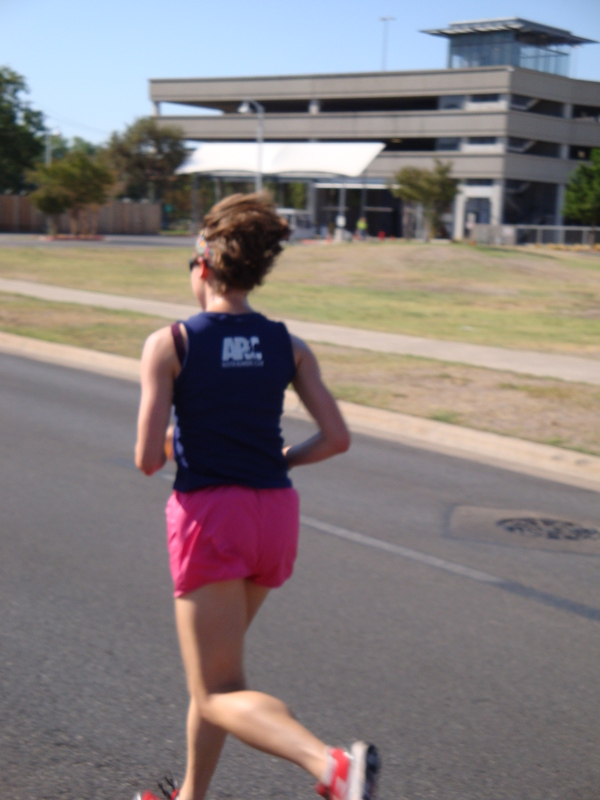 AK ran the 4th leg, which was the 1st of the 5K legs. This is usually my leg. And then the 5th leg. The race program called this the caboose. Anchor, caboose, whatever. Here is my caboose being the caboose. 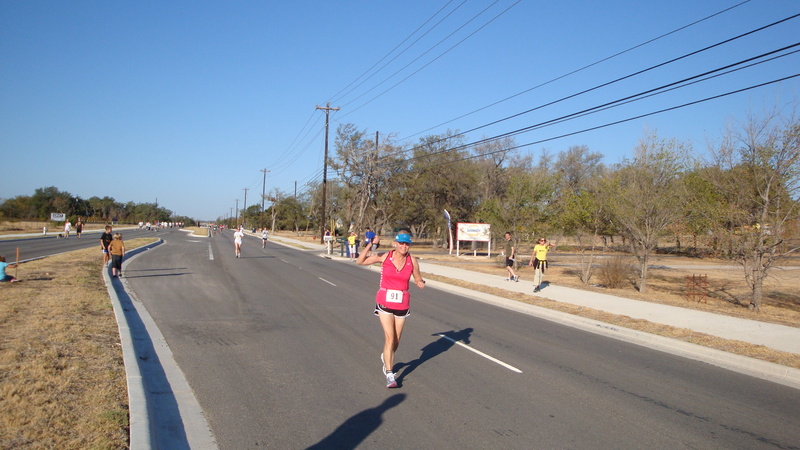 The course is not hard, however, the heat every year is hard. This was the hottest weather they’ve ever had (and they started the first couple of years doing this in July!). The last 2 years, the sun really got to me in the middle and end of the course. No shade, nothing but wide open asphalt. So this year, because we were under a heat advisory and I wanted to be smart. I held back for the first half. 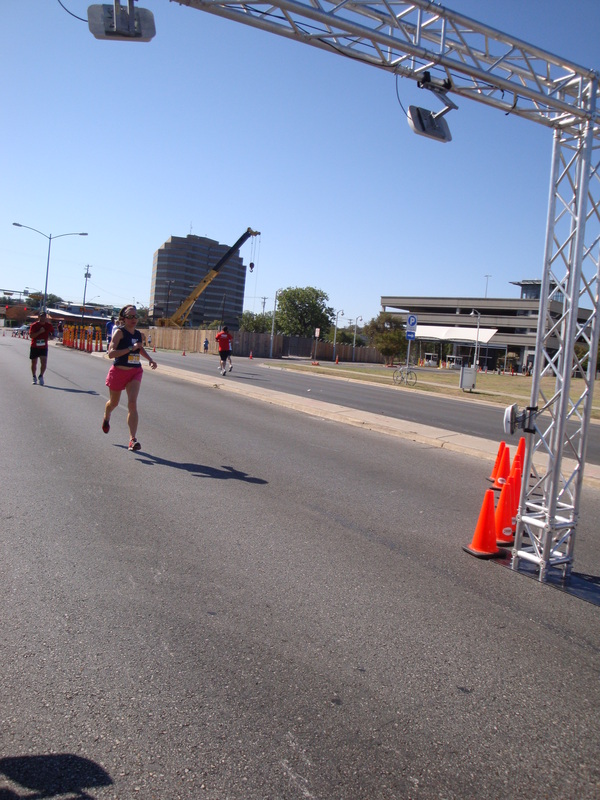 I still wasn’t sure how I’d feel, expecting the sun to get me when I turned around to complete the last half. It was hot, but not as hot as I remembered last year. I finished fast and strong. And I think I had more in me. I ran a course PR for myself, but about 10 seconds slower that AK. I know I could have run faster, I held back too much in the beginning and middle for sure. What really stinks is, while I am really proud of our 3rd place in open women’s division, we were less than a minute out of first place. I am certain I could have run fast enough to get us into 2nd place, possibly even 1st the margin was VERY narrow. The timing overall was accurate, but our splits were all screwed up, so I have no idea how fast any of us really ran, other than Garmin times. I started mine early, before AK cross into transition, so I could get the handoff from her, so not sure how close my Garmin time was to the actual chip. I need to retire that singlet. It’s way too darn short. Makes my shorts look like I have them pulled up to my neck! 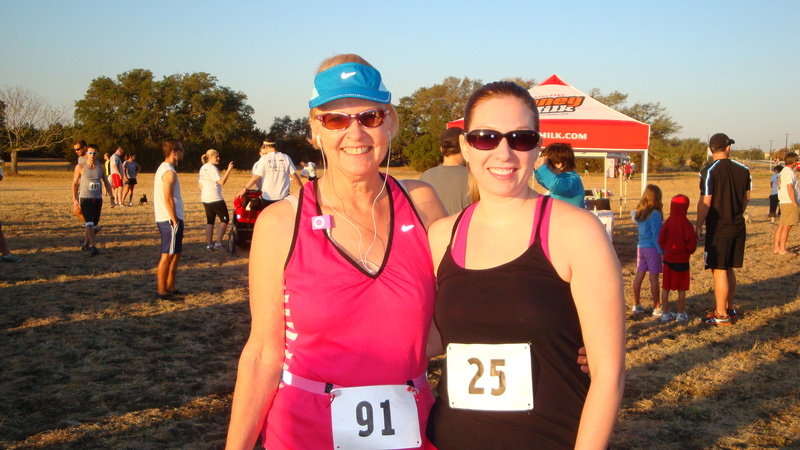 I don’t usually say this, but it made me want to do another 5K! 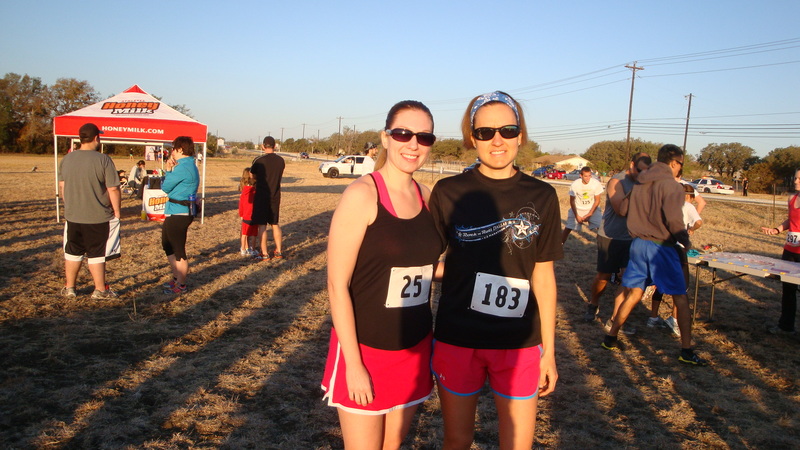 Started off Saturday with the Rescue Run 5K, which benefitted Williamson County Humane Society. The weather was GORGEOUS and actually cool. Mom, sister, and I were registered for the 5K. We all wore pink and black, lol! Dad and sister’s boyfriend were registered for the 1 mile doggie walk. They never left the house. 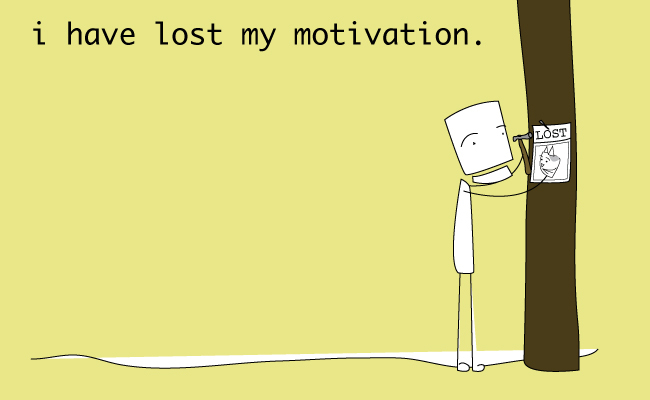 Guess motivation was lacking to walk a mile. 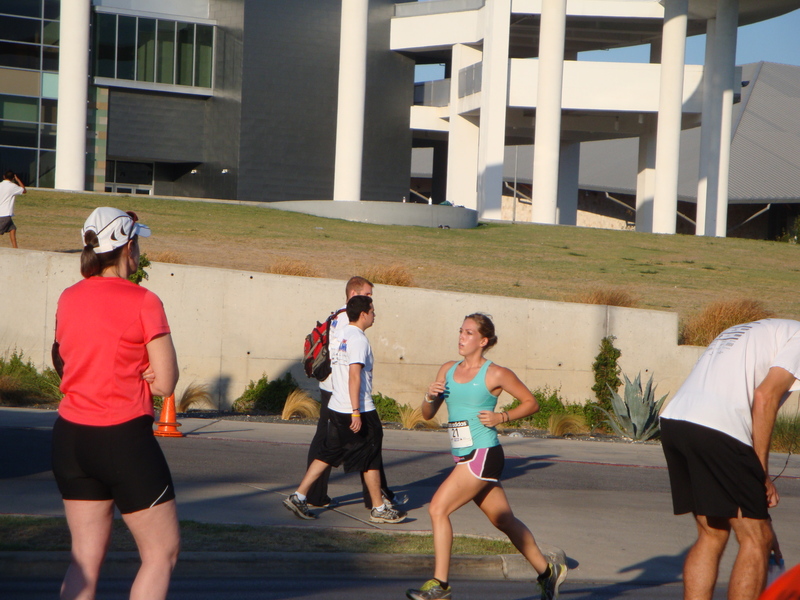 I ran with sister, to help support her. She thinks she PR’d. Not sure because she’s run probably ten 5Ks ever, but only had 1 of them chip timed (other than this one) and that was 5 years ago. Mom Galloway’d on her own. No PR. It was her best racing weather she’s had, I was surprised. The race was good overall. It was SO hard to be at the animal shelter though. 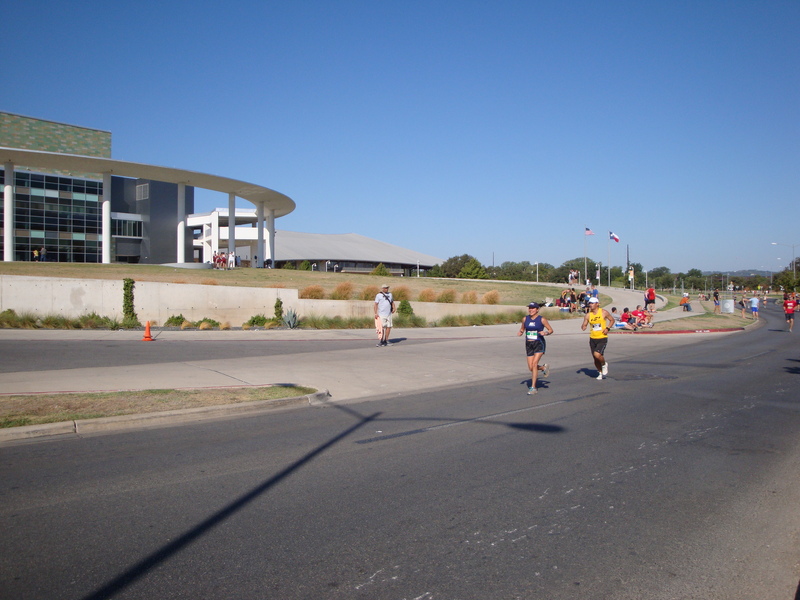 The course ran down the main road and around the new high school (rural area). But my car was parked by one of the kennels. I cried at least twice before I even got out of my car. I hadn’t been to a shelter since I got Chanel, because I am way too senstive. I really want a dog, but Dan and I are never at home. I even bonded with one of the new intake dogs but I know Dan is probably right when he says no. I need to not let the fact I want a running buddy and someone to keep me safe when Dan’s always gone not get in the way of the reality of being super busy and always gone. 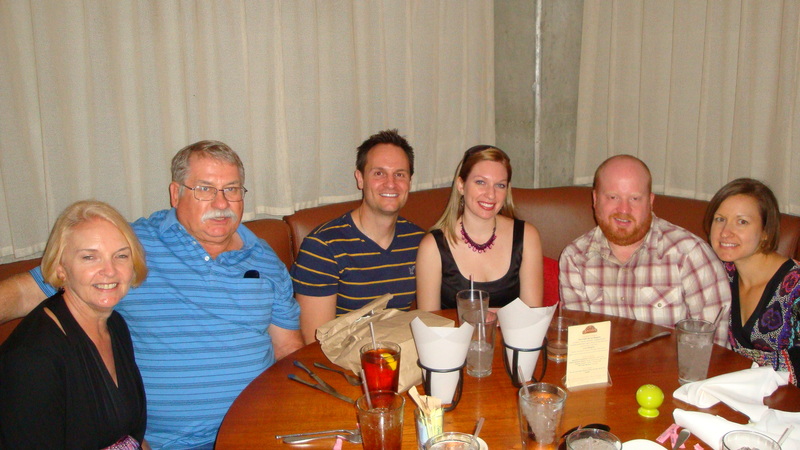 That night we headed to Garrido’s for dinner in downtown Austin. Dan rode his bike to dinner, so he’s red from the heat and his helmet. He was heading south after dinner for a charity rally on Sunday. Dan had the biggest shrimp chile relleno i’ve ever seen. 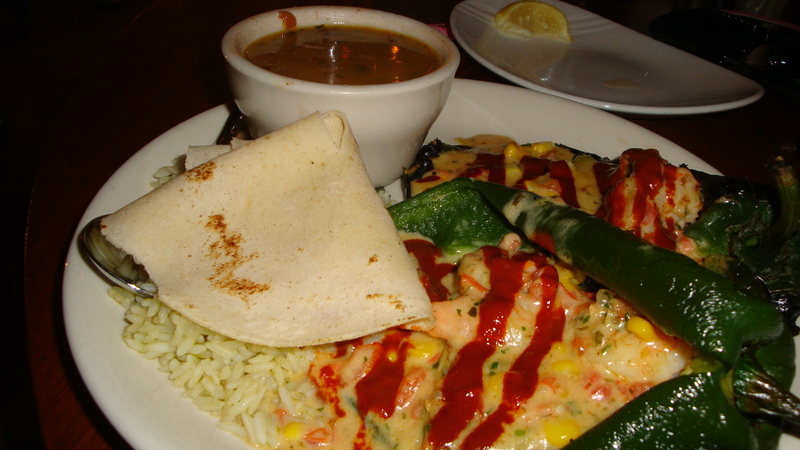 I tasted the chile and the shrimp, it was GOOD! 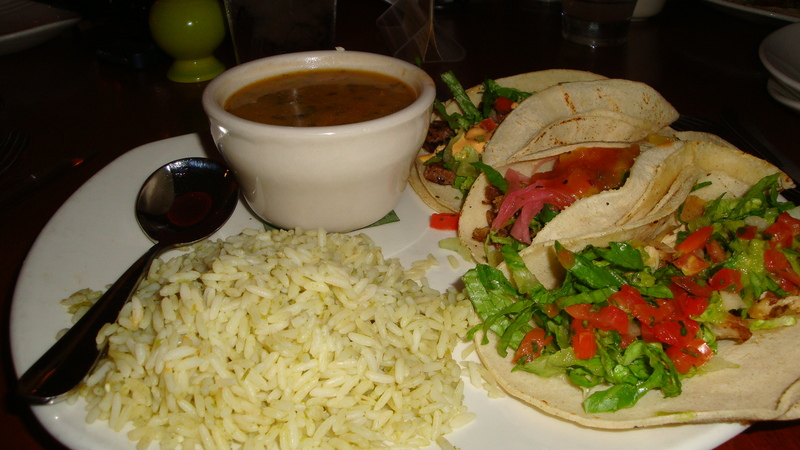 I had a taco plate with charro beans and rice. I chose 3 different tacos. Just happens that 95% of their menu is gluten free, minus the fried items. It was good, but the rice was a fail. I am just SO picky when it comes to rice at Mexican Restaurants. It was supposed to be cilantro rice, I didn’t like it. The tacos were good, but I wouldn’t order the chicken again, it wasn’t that exciting. The beef and the pork were both very good and they had some of the best corn tortillas I’ve ever had. Sister wanted money for workout clothes, so my parents gave her cash money and I got her a big fat gift card to Luke’s Locker. 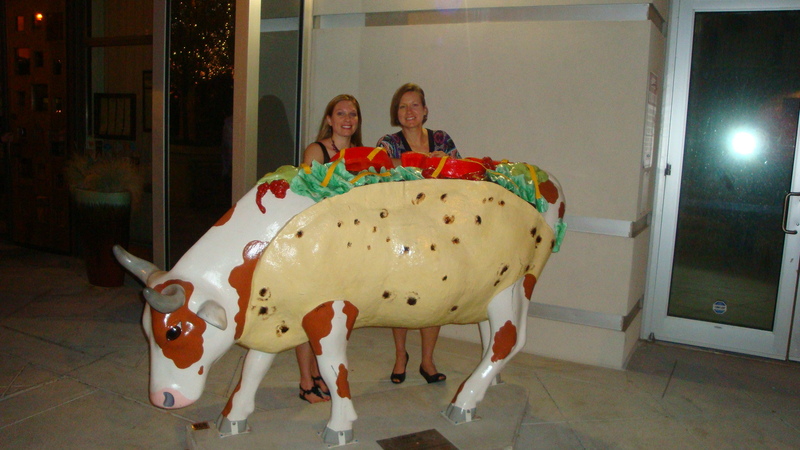 On the way out, we had to have a photo with the Ta-Cow! Still amazed that CowParade Cows are still popping up everywhere! After they all had dessert, I drove mom and sister to show them the turnoffs for their Sunday morning long runs and then headed back North. Great evening! Happy Birthday Sister! I felt good for the first 16, the last 2 were hard but the pace was decent. Big thanks to my fabulous AK for keeping me company on a new route in the streets of Austin and printing a map. 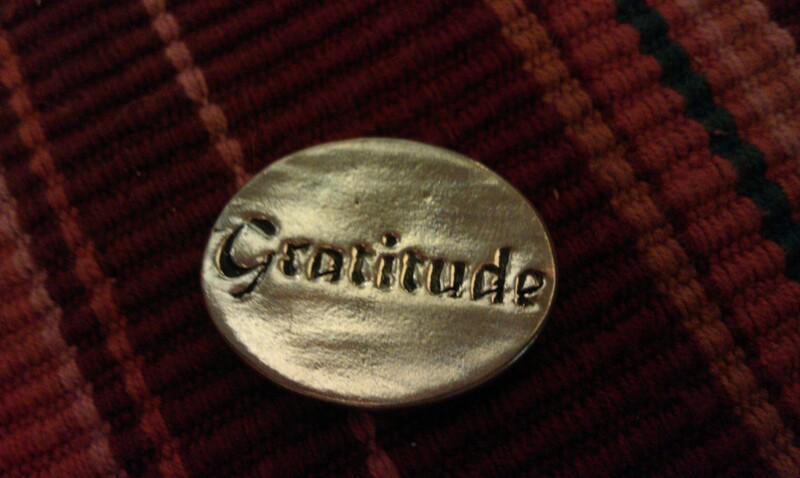 Gratitude is definitely something I need to work on. 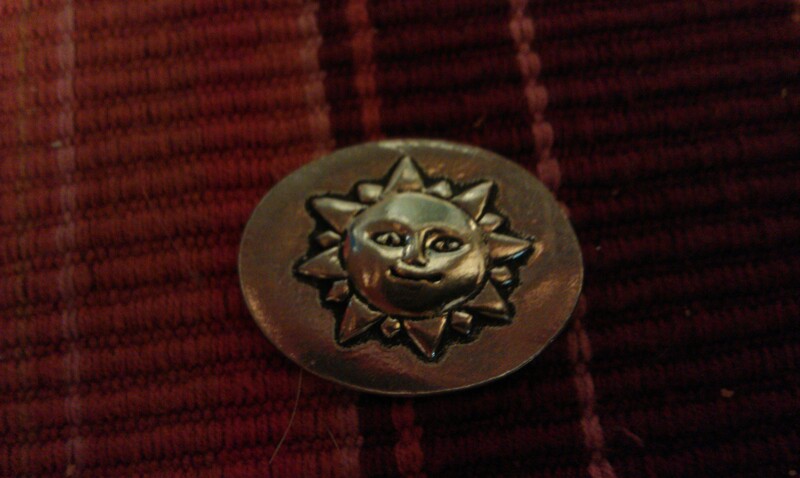 To remind myself, I bought myself this cute little coin in Georgetown a few weekends ago. Keep it in my wallet. Today I am grateful for the little things. Like Missy loving me no matter what my mood is. I am grateful though, that I am still able to be active, even if it’s not what i’m used to. I decided after doing more and more reading of medical journals for the last week, that I want to get a 2nd opinion on the treatment of my Hashimoto’s. Maybe that’s not the root of my problems, but I want to know for sure. Found someone who only does work in that area, waiting on a referral to see them. This idea was reinforced today when I tried to go from the ground floor to the third floor to check my mail. I only made it to the second floor landing before I had to take a break because of my legs. It’s that kind of thing that really eats away at me. Honestly, I should be grateful I have the option to take the stairs, there are so many who can’t. Nothing beats a simple, yet filling and inexpensive tasty meal. 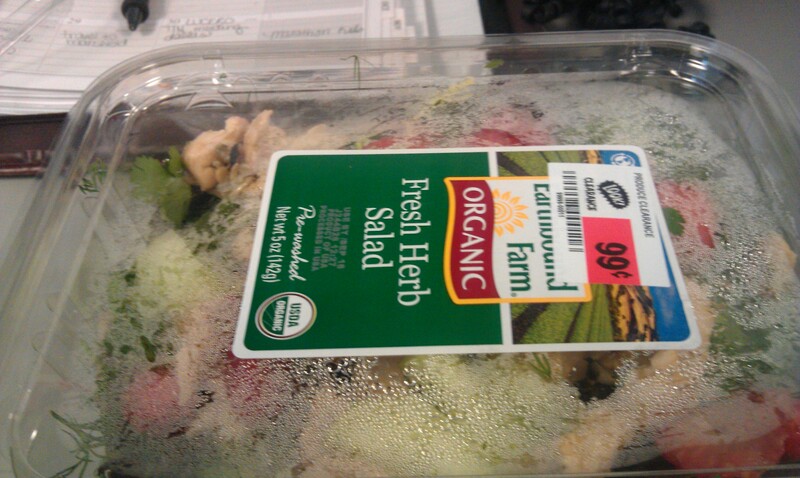 1 carton organic fresh herb salad which was on clearance (and 100% still fresh). 99 cents as opposed to $5. 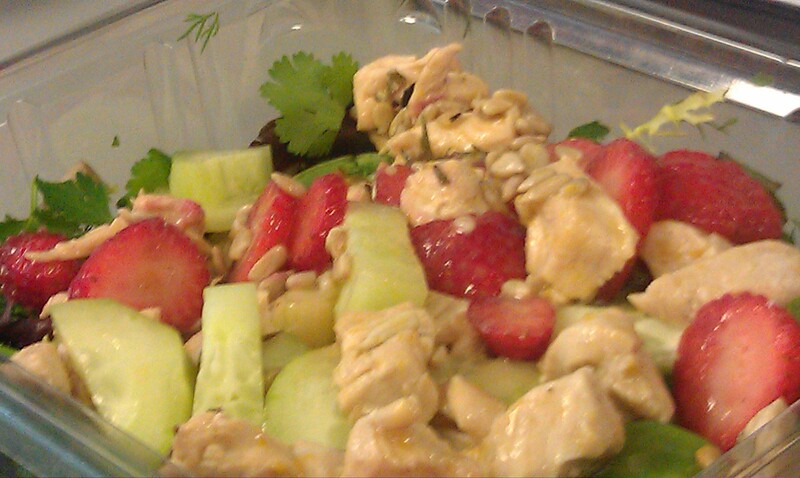 Big salad for little points. 6 WW P+! Dinner was leftovers repurposed. Took that Italian Zucchini Quinoa Casserole and made it into an italian bowl. 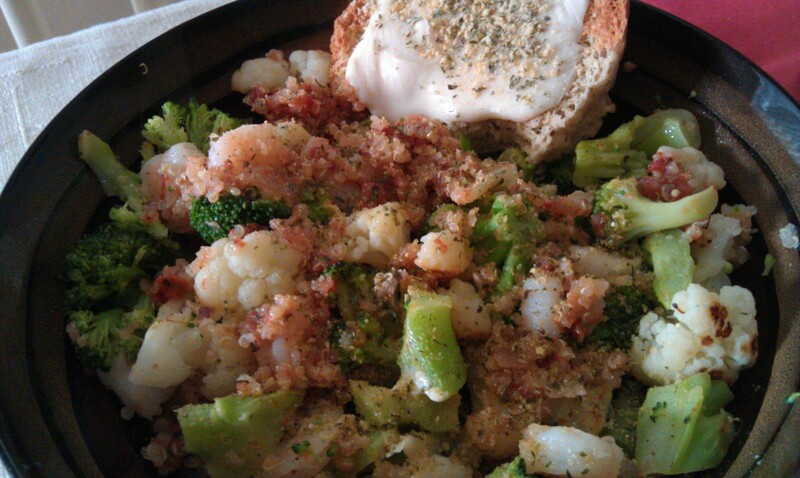 Broccoli, cauliflower, the zucchini quinoa casserole, and cooked shrimp. Side of Udi’s gluten free bread with some dairy free cheese. Another easy and simple quickie meal. Yes, as you can tell by what I’m eating, Dan is still out of town 😉 I am grateful he’s coming back at least for a few days. Seems like i’ve seen him very little in the last month. I had a flashback driving to the dentist on Monday morning. I was driving down Duval Road and I saw a girl running. I learned to run ON Duval Road. I used to live on the other end. Once upon a time, I was that girl. A morning run down Duval looked nice. A lot nicer than going to the dentist. Funny how things change. And well, I don’t look like this anymore. 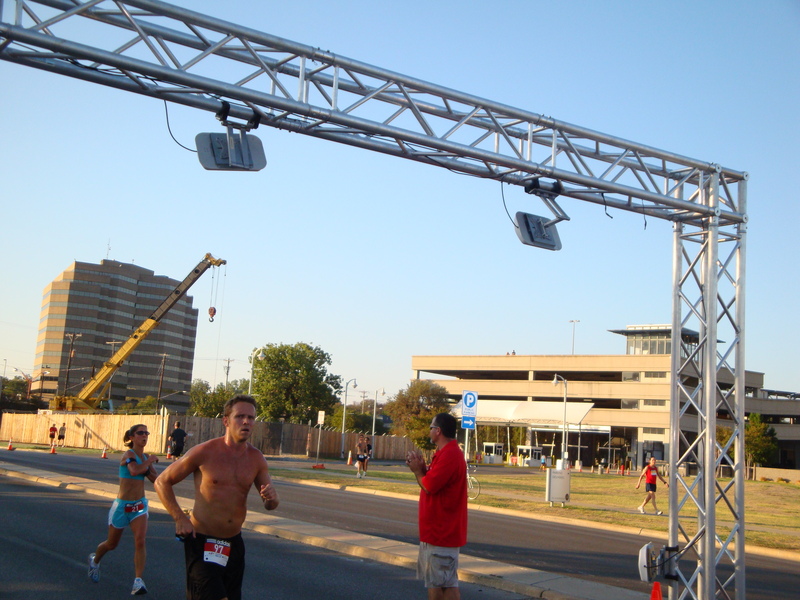 This was my first 5K which was April 2006. 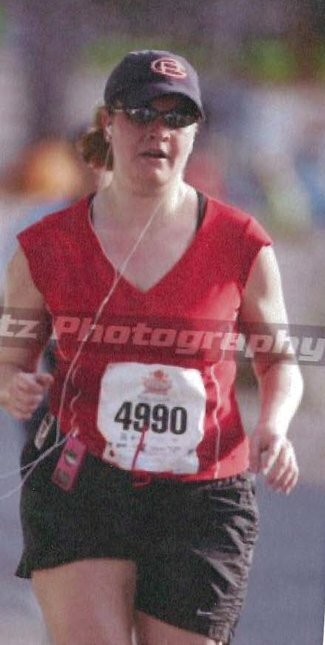 Running didn’t make me skinny (obviously), but it started my transition into a healthier lifestyle. 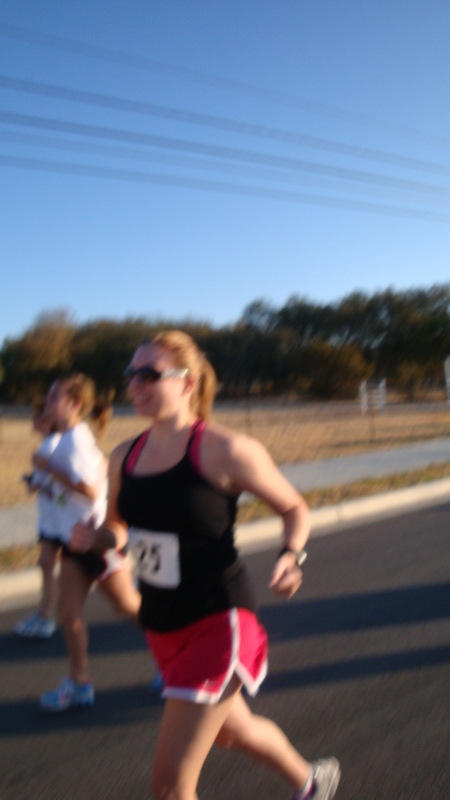 Step 1 was beginning to run in 2006, step 2 was joining Weight Watchers in 2007. Step 3 is vowing never to go back to looking like that girl in that photo. DOR for me today. This week is all screwy because of my sister’s birthday and her wanting us all to do a 5K on Saturday. With that being planned, I had to move my long, which threw off the Friday DOR I was trying to get back to. It’s part of life and being flexible is key. Instead, I opted to attend a WW meeting instead at a local church (to free up my evening tomorrow). I can safely say I will not go back to that one. I simply cannot stand negativity and whining, especially coming from 30+ people my mom’s age or older. It’s no wonder most of them are seing no success. 1 lady spoke and had the same mindset as me. I know it’s weird, but I had to tell her afterward that her attitude was refreshing. My didn’t start off so well. Had a dentist appointment in the AM. I somehow chipped one of my teeth on the way to San Francisco last month, so I need that fixed. Plus I have a cavity. Don’t understand how I made it this far in life having no dental problems and now they appear. I scheduled everything for Friday. Unfortunately later in the day the Dr. decided he didn’t want to work Friday afternoon and cancelled my appointment. Looks like it’ll have to wait until October. Speaking of medical, my first test result came in from my regular doctor. I don’t have Lyme disease. I was annoyed the Dr. even tested for it. I haven’t been in the woods, especially in the Eastern US, which is something they usually screen for before testing you. unnecessary and random if you ask me. 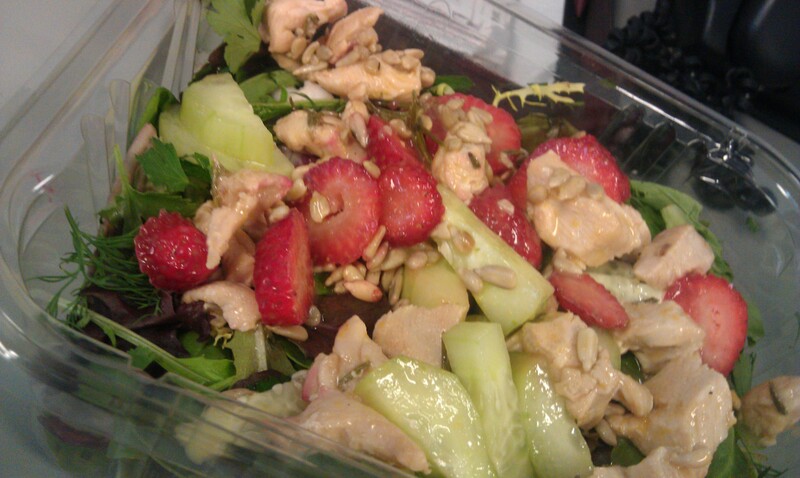 While Dan’s away, I love to try new recipes that I know he won’t eat (or I just make them for my lunches). 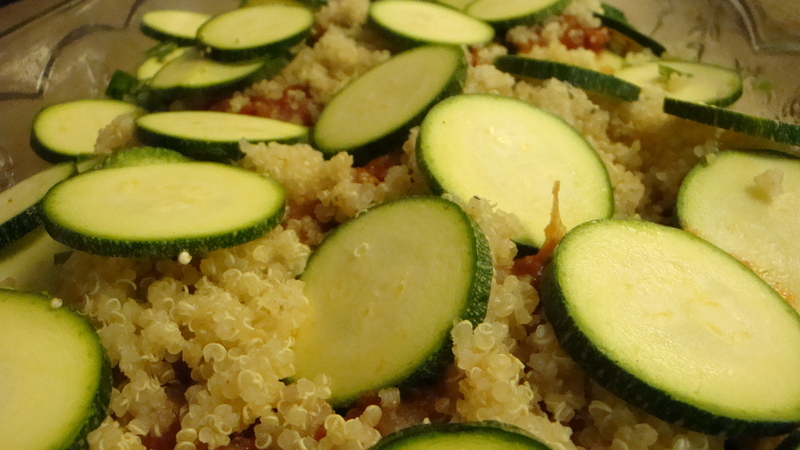 This week I tried Mother Rimmys Italian Zucchini Quinoa Casserole . Dan won’t eat quinoa, he says it a texture thing. The only modification I made was to leave the cheese out. I actually added it to mine when serving. I am sure more casserole like with the cheese binding it, but I didn’t have any shredded dairy free cheese. I had some regular cheese that I could have used, but my little experiment trying to eat yogurt went horribly wrong, so the dairy is out again. Served with garlic herbed tilapia, roasted asparagus, and broccoli. I don’t even want to know what Dan ate for dinner tonight. They usually do fine dining all week long at the trade show and their big entertaining dinner was tonight. I am sure it was insanely over the top. Those boys don’t mess around when it comes to fancy restaurants and good food. Pretty sure he’s chowing down on a $200 filet mignon right now, lol.